I remember Julia Child saying that fish should be defrosted slowly, so the ice crystals in the flesh don't make the fish mushy. I'm thinking I'll defrost them by moving this to the fridge from the freezer. How long do you think it will take to defrost? Any other tips? Put all that in a dish to catch the melting liquid and into the fridge for at least 24 hours. After a night in the fridge, there hadn't been much progress, so I put the block on the counter. 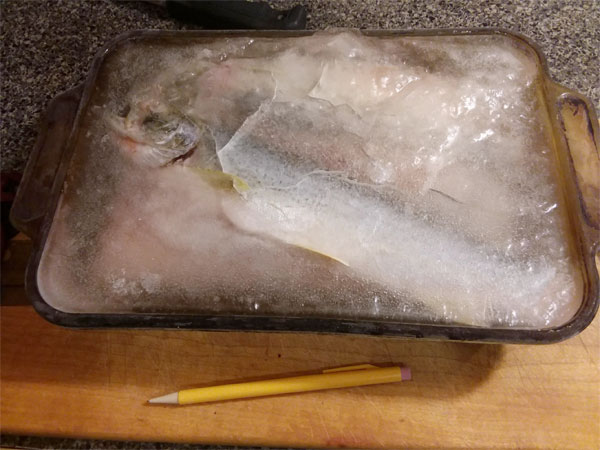 By afternoon I could pull the ice away from the fish, and I put those bad boys back in the fridge. They were just right at dinnertime, and tasted just as good as fresh. The fish sounded wonderful and I loved the Christmas card. Not annoying at all.